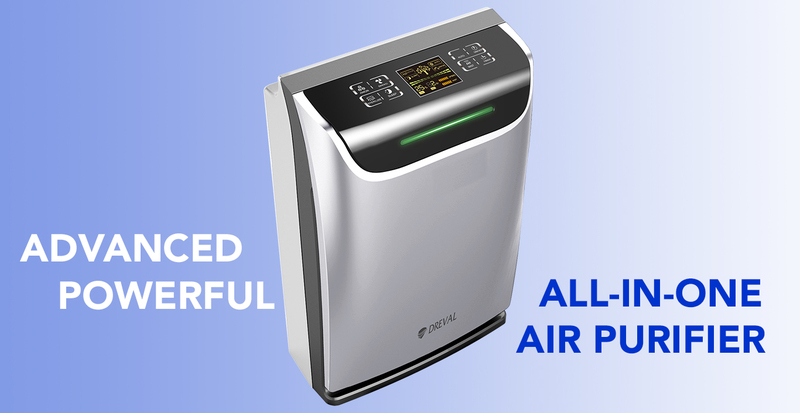 The All-In-One Dreval 7-Stage Air Purification System with HEPA Filter, UV Germicidal Lamp, and Humidifier does everything you need for the perfect balance of clean, comfortable, and healthy breathing air. With only the newest and best advanced technology in the field, only the highest quality of materials, and only the most useful and convenienct fuctions and features, the Dreval D-950 is quickly becoming a necessity in households, offices, libraries, classrooms, and other facilities all over the world. The perfect combination of the latest and greatest technology, unmatched power and efficiency, and the most useful, convenient, and beneficial features and functions meet inside this machine to create the ideal system of advanced air filtration, humidification, and additional purification. The new all-in-one Dreval D-950 takes care of all your air filtration needs from poor quality air, foul odors, dry air, dust, pet dander, germs, viruses, bacteria, allergens, and other airborne particles and pollutants. OPTIMAL AIR QUALITY - ALL THE TIME! Enjoy the time spent with your loved ones instead of worrying about germs, allergens, foul odors, dust, and other airborne pollutants and impurities in the air you are breathing! In addition to 5 layers of advanced air filtration, you can turn on the Humidifier Function for dry conditions, the Negative Ion Generator for poor air quality, the 345nm wavelength UV Sterilization Lamp for excessively poor air quality, the timer for specific purification sessions or blocks of time, and MORE! In a hurry? Press the AUTOMATIC button and walk away; the machine takes care of everything else! Play date for the kids? Press the UV STERILIZE button to help eliminate and stop the spreading of germs, bacteria, viruses, and less than pleasant odors. Smelly socks, shoes, and/or feet in the house? It may sound silly but it's a significant problem for many people. Press the UV STERILIZE button and/or the ANION button for immediate relief of foul odors and removal of germs, fungus, and bacteria. Air too dry? Press the MIST button to optimize the humidity level in the room and match it to your perfect and comfortable humidity level. Food and cooking odors? Press the ANION button for extra cleaning power and elimination of unpleasant or overpowering odors. Feeling particularly tired, stressed, and/or unmotivated? The ANION button also helps with fatigue, stress, insomnia, and even constipation! Extra dusty room? Yes, the ANION button helps with dust too, pulling it right out of the air! Do you ever wake up to a stuffy, slightly smelly room? Press the SLEEP button and the Dreval Air Purifier manages the air, humidity levels, wind speed, odors, and more, all while you sleep so you can wake up refreshed and ready for the day! Study session or book club meeting? 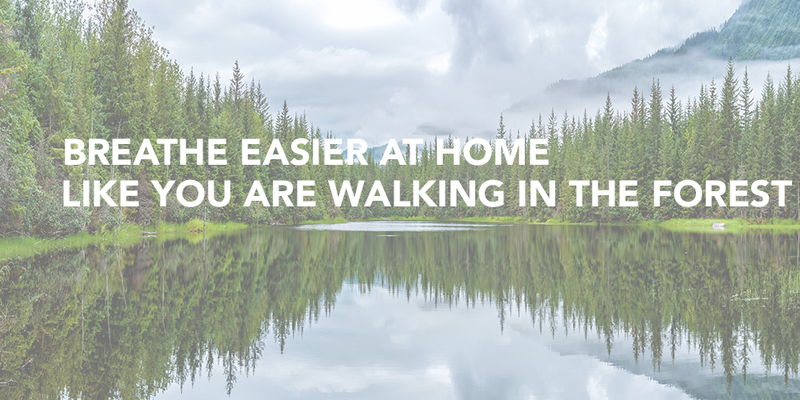 Press the TIMER button for specific time periods of clean, germ-free, healthy air. How Does the Dreval Air Purifier Work? The air in the room first passes through and becomes absorbed by the Cold Catalyst Filter. Harmful gases (such as ammonia, formaldehyde, toluene, TVOC, benzene, xylene, and hydrogen sulfide) are eliminated. Next, the air passes through the Cellular Activated Carbon Filter, which has a 98% absorption rate, and also absorbs odors and harmful gases. The Antimicrobial Filter is next and with a particle retention rating of 5 microns and a 99% bacteria removal rate, it kills dangerous bacteria and other microorganisms. The air then travels through the HEPA filter where 99.97% of particles 0.3um and larger, such as smoke, dust, bacteria, viruses, allergens, and other pollutants, are removed. Before re-entering the room, the air is first cleaned and bacteria is removed with the UV Germicidal Lamp. 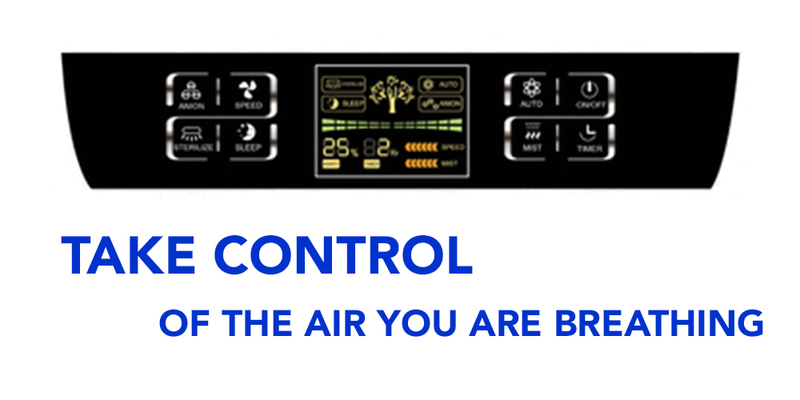 The optional Negative Ion Generator can be switched on to enrich the cleaned air with negative ions. The Humidifier function helps maintain suitable and appropriate humidity levels in the room by emitting healthy mist into the air to improve air quality. Finally, the Intelligent Odor Sensor System determines and then indicates the quality of the air in the room with the color RED for Poor, ORANGE for Normal, and GREEN for Excellent Air Quality. Cold Catalyst Filter: Breaks down harmful gases, kills copious types of bacteria, decomposes and removes toxins, and helps eliminate toxins such as ammonia, benzene, hydrogen sulfide, formaldehyde, xylene, TVOC, toluene, and myriads more. Cellular Activated Carbon Filter: This filter has a 98% absorption rate, removes odors from the air, and absorbs harmful gases. Its plethora of small, low-volume pores increase the surface area for a more thorough and effective absorption and removal process. Antimicrobial Filter: With a particle retention rate of 5 microns and an additional antimicrobial rate of 99%, this filter works as an antimicrobial agent and eliminates dangerous microorganisms and bacteria from the air. HEPA (High Efficiency) Filter: Meeting the HEPA (High-Efficiency Particulate Absorption) Standard and satisfying standards of efficiency set by the US Department of Energy, this filter removes 99.97% of particles sized 0.3 um or larger. It also removes smoke, dust, bacteria, viruses, allergens, and much more, and is regularly used in facilities and locations such as medical offices and facilities, aircrafts, homes, automobiles, airports, offices, department stores, and countless others. UV (Ultraviolet) Sterilization Lamp: This 245nm wavelength ultraviolet germicidal lamp kills bacteria, eliminates musty and other foul odors, and helps prevent the spreading of viruses and bacteria through the air. Intelligent Odor Sensor System: This remarkably advanced air purifier actually tells you the quality of your air! With its Intelligent Odor Sensor System, the purifier determines the breathing quality of the air at any particular time and indicates the quality with a 3-Color System – Red for Poor, Orange for Normal, and Green for Excellent Air Quality. Humidifier: Helps maintain suitable, appropriate, comfortable, and healthy humidity levels in the room. This function also emits healthy mists into the air to improve air quality. *Filters are washable but should be replaced approximately every 6-12 months depending on air quality on product usage.